In polar and alpine regions that are sufficiently cold, snowfall can persist from year to year and consequently can build up in layers. With time, the weight of the snow compresses the deeper snow layers to form solid ice, resulting in a sheet of ice and snow called a glacier. Each layer of snow, which eventually becomes a layer of ice, carries with it some information about the environment and climate that existed when the snowfall occurred. By drilling down into glaciers and removing long cores of this layered ice and snow, scientists can better understand how Earth's climate has changed over time. There are three main types of information about the climate and environment that are stored with the snow as it turns into ice: impurities in the snow, air spaces between snow grains, and pure ice itself. 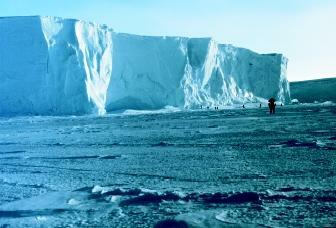 The vast ice sheets of Greenland and Antarctica provide the oldest records of ancient climatic conditions. Physical and chemical characteristics of deep ice layers give scientists information regarding the environment in which the ice formed. small droplets called aerosols. When water droplets in the atmosphere cool, they freeze much more readily if they can attach to dust and aerosols, and so snowflakes generally have microscopic impurities in them. The dust and aerosols can come from natural processes like dust storms, forest fires, volcanoes, and sea spray (which provides salt-based aerosols). Natural chemical reactions in the atmosphere also produce compounds that are detectable in the snow, and even living organisms can produce chemicals that are found as far away as the South Pole. Impurities also come from atmospheric pollution produced by human activities. The second type of signal recorded in ice cores comes from the spaces between snowflakes as they get buried. During burial, the snowflakes become compressed to a granular, porous form known as firn. The air in the pore spaces becomes trapped in bubbles as the firn is compressed to ice. This may take decades or longer to be achieved, but once trapped, the air bubbles act as time capsules of the ancient atmosphere. The capsules can be broken open and the composition of the ancient atmosphere measured. In this way, scientists are able to see the changes to the atmosphere caused by human use of fossil fuels, as well as the natural changes that have occurred as ice ages have come and gone. The third type of signal recorded in ice cores is encoded in the pure ice itself. Ice, or more generally water, is made up of two atoms of hydrogen and one atom of oxygen. Naturally occurring hydrogen and oxygen both come in rare heavier forms called isotopes (see sidebar). In sea water, one in about every 500 oxygen atoms is the heavy isotope, whereas one in about 70 hydrogen atoms is heavy. As water evaporates from the sea, is transported in the atmosphere, and finally falls as snow in polar areas, the exact proportion of heavy isotopes changes in ways that are mostly controlled by temperature. By measuring the isotopes of oxygen and hydrogen in the ice, scientists are able to deduce what the temperature was when the snow originally fell. An ice core sample is produced by drilling a circular pipe-like device into thick ice and then pulling out the cylindrical piece. 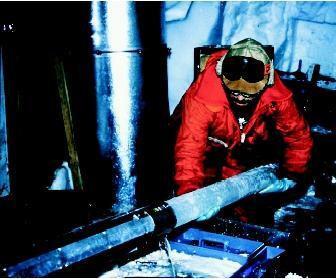 Here an Antarctic ice core from 1.2 kilometers (about 0.75 miles) below the surface is removed from the drill. The age of the ice is at least 130,000 years. During the last 30 years of the twentieth century, many ice cores have been drilled to study past climate. A full picture of past climate requires cores from a wide range of locations, in much the same way as modern meteorological records need to be collected over a wide network. Ice cores have been retrieved from almost all glaciated areas of the Earth, including Greenland, Antarctica, the Himalayas, and the Andes. The longest records come from the major ice sheets of Greenland and Antarctica, which are over 3 kilometers (1.9 miles) thick and produce records stretching back several hundred thousand years. These long drilling projects use a self-contained drill suspended from a cable at the surface. Depending on the drill type, a length of between 2 and 6 meters (6.6 and 19.7 feet) of core can be drilled, before the whole assembly is raised to the surface, emptied, and lowered to drill another section. The diameter of cores ranges from 10 to 13 centimeters (3.9 to 5.1 inches). Drilling a major core thousands of meters in length can take many months to even a year or more. Drilling often is conducted in summer-only field seasons, so the duration of the project might be several years. Some analysis of cores may take place in the field, but the bulk of the core is usually returned from the field in frozen storage. Typically, sections of the core are then analyzed in laboratories of different cities, states, or even countries. To establish the age of a core segment, a variety of techniques may be used. The most straightforward method is to examine a signal in the core that varies strongly with the seasons. The seasonal highs and lows in the measurements reveal the annual layers, which can then be counted in much the same way as annual rings in a tree trunk can be counted. This method of age determination may be limited at sites where the yearly snowfall accumulation is low because the resulting layers of ice are so thin that they cannot be clearly distinguished. Another limit comes from the fact that the ice in glaciers flows downwards and outwards. This causes deep and old layers to be stretched and thinned, so direct counting of layers eventually becomes impossible. Where layers are no longer detectable, mathematical models that describe the physics of ice flow can usually estimate the age. The oldest and deepest cores from inland Antarctica have ice that is dated at over 400,000 years old, whereas deep Greenland cores have been dated to over 130,000 years. Determining these old ages relies on ice flow models, but actual counting of annual layers has been used to date ice cores back to the peak of the last ice age, roughly 20,000 years ago. The results of ice core studies are dramatic. For example, from ice cores it is known that greenhouse gas levels have not been as high as present at any time in the last 400,000 years. It is also known that rapid climate change of several degrees or more had occurred in as little as a decade. Using these clues about past climate, scientists are better able to understand and predict how climate in the future might be affected by human activities. SEE ALSO Fresh Water, Physics and Chemistry of ; Glaciers and Ice Sheets ; Glaciers, Ice Sheets, AND Climate Change ; Global Warming and Glaciers ; Global Warming and the Ocean ; Hydrologic Cycle ; Ice Ages ; Ice at Sea ; Isotopes: Applications in Natural Waters . Benn, Douglas I., and David J. A. Evans. Glaciers & Glaciation. London, U.K.: Arnold, 1998. Bradley, Raymond S. Paleoclimatology: Reconstructing Climates of the Quaternary, 2nd ed. San Diego, CA: Harcourt/Academic Press, 1999. Paterson, W. S. B. The Physics of Glaciers, 3rd ed., London, U.K.: Elsevier/Pergamon, 1994. Isotopes of an element share the same chemical behavior, but in physical processes they are often transferred at different rates because of the difference in mass. In hydrology, the key isotopes are oxygen-16, oxygen-18, hydrogen-1, and deuterium (hydrogen-2, or hydrogen with atomic mass 2). As water changes state from liquid to vapor and vice-versa, the ratio of the isotopes changes. Heavier isotopes evaporate from liquids less readily and condense out of vapor more readily. im sorry to say that i am utterly dissapointed that you didn't include anything about catabatic winds, this is about weather not snow impurities!